4 | Oncology Advances Cytogeneticists and pathologists in the Department of Pathol- ogy and Center for Neuro-Oncology at Dana-Farber/Brigham and Women's Cancer Center have developed a whole genome array comparative genomic hybridization test (array CGH) to accurately diagnose various types of brain tumors, provide prognostic information, and aid in patient selection for clinical trials and interpretation of clinical trial results. As one of the first whole genome tests to be routinely applied to cancer patients as part of their clinical care, array CGH exam- ines an enormous range of copy number variations. Results are combined with information generated through exome sequenc- ing performed as part of the Profile research study at Dana- Farber/Brigham and Women's Cancer Center, as well as con- ventional histopathology and immunohistochemical tests. This extensive testing generates a range of reports that are then ex- amined collectively by a cross-disciplinary diagnostic tumor board comprised of pathologists, cytogeneticists, and other ex- perts. To date, the array CGH test has been applied to more than 1,000 brain tumor cases of all tumor types, including meningiomas, glioblastomas and other types of gliomas. Both array CGH and Profile testing are performed in the Center for Advanced Molecular Diagnostics (CAMD) at Brigham and Women's Hospital, which is co-directed by Azra H. Ligon, PhD, and Neal I. Lindeman, MD. 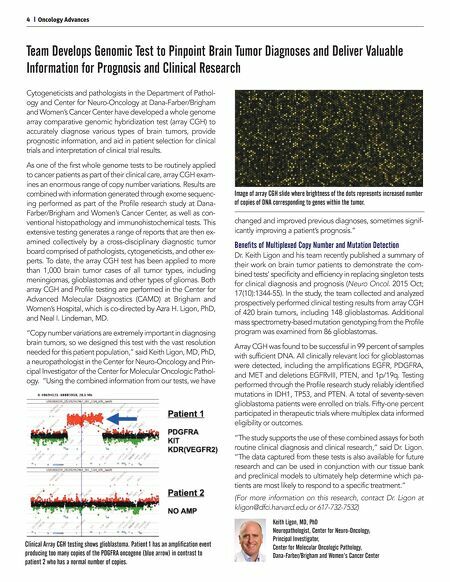 "Copy number variations are extremely important in diagnosing brain tumors, so we designed this test with the vast resolution needed for this patient population," said Keith Ligon, MD, PhD, a neuropathologist in the Center for Neuro-Oncology and Prin- cipal Investigator of the Center for Molecular Oncologic Pathol- ogy. 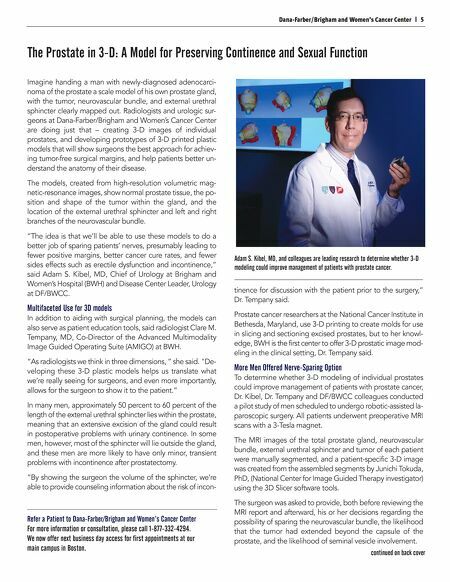 "Using the combined information from our tests, we have Team Develops Genomic Test to Pinpoint Brain Tumor Diagnoses and Deliver Valuable Information for Prognosis and Clinical Research changed and improved previous diagnoses, sometimes signif- icantly improving a patient's prognosis." Benefits of Multiplexed Copy Number and Mutation Detection Dr. Keith Ligon and his team recently published a summary of their work on brain tumor patients to demonstrate the com- bined tests' specificity and efficiency in replacing singleton tests for clinical diagnosis and prognosis (Neuro Oncol. 2015 Oct; 17(10):1344-55). In the study, the team collected and analyzed prospectively performed clinical testing results from array CGH of 420 brain tumors, including 148 glioblastomas. Additional mass spectrometry-based mutation genotyping from the Profile program was examined from 86 glioblastomas. Array CGH was found to be successful in 99 percent of samples with sufficient DNA. All clinically relevant loci for glioblastomas were detected, including the amplifications EGFR, PDGFRA, and MET and deletions EGFRvIII, PTEN, and 1p/19q. Testing performed through the Profile research study reliably identified mutations in IDH1, TP53, and PTEN. A total of seventy-seven glioblastoma patients were enrolled on trials. Fifty-one percent participated in therapeutic trials where multiplex data informed eligibility or outcomes. "The study supports the use of these combined assays for both routine clinical diagnosis and clinical research," said Dr. Ligon. "The data captured from these tests is also available for future research and can be used in conjunction with our tissue bank and preclinical models to ultimately help determine which pa- tients are most likely to respond to a specific treatment." (For more information on this research, contact Dr. Ligon at kligon@dfci.harvard.edu or 617-732-7532) Keith Ligon, MD, PhD Neuropathologist, Center for Neuro-Oncology; Principal Investigator, Center for Molecular Oncologic Pathology, Dana-Farber/Brigham and Women's Cancer Center Clinical Array CGH testing shows glioblastoma. Patient 1 has an amplification event producing too many copies of the PDGFRA oncogene (blue arrow) in contrast to patient 2 who has a normal number of copies. Image of array CGH slide where brightness of the dots represents increased number of copies of DNA corresponding to genes within the tumor.